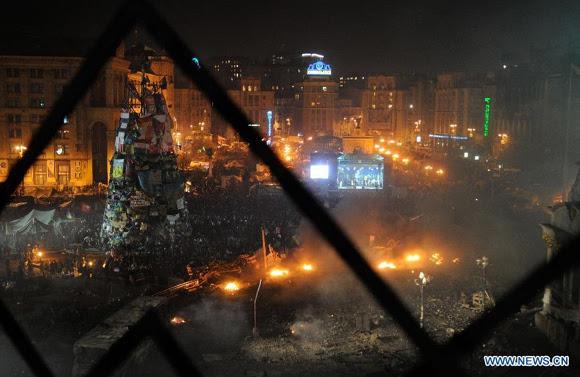 Feb 22, 2014 - Bloody clashes flared again in the Ukrainian capital Kiev on Feb. 18 between armed radicals and police. Ukraine’s Health Ministry said 75 people died and hundreds were wounded. This is the most serious bout of violence since Ukraine’s independence. The whole world was shocked. How did the political crisis in Ukraine occur? Both the Ukrainian leadership and the opposition are to blame for the crisis. The current regime needs to be more cautious about its policy shift. Since Viktor Yanukovych was elected Ukrainian president in 2010, strengthening cooperation with Europe has been a priority of his foreign policy. However, on the eve of signing the landmark political-economic partnership agreement with the EU, the Ukrainian government abruptly suspended preparations for the accord, citing the interests of "national security." And the decision the Ukrainian government made was too subjective. After a month’s protests, the Ukrainian authorities misjudged the situation and thought the Ukrainian opposition would perish soon. However, the anti-protest law has intensified the contradictions. The protests that might be otherwise quieted down escalated abruptly. In addition to its policy incoherence and subjectivity, the Ukrainian government also showed its flabbiness. After the conflicts turned to violence, the Ukrainian authority changed its hard-line stance and has given too much ground to the opposition. The appeasement has finally resulted in the situation going out of control. The blame also lies with the opposition because it has put the power struggle on top of the national interest and taken violence as an effective means to win. In an effort to find a solution to the nationwide unrest, President Yanukovych accepted the resignation of Prime Minister Mykola Azarov and his cabinet. But the prime minister’s resignation hasn’t satisfied the protesters. The opposition leader refused to work as prime minister. He raised the stake by asking an immediate amendment to the new constitution introduced in 2004 and a snap presidential election. Seeing that peaceful means wouldn’t help them achieve what they want, the protests became violent. Compared with the "Orange Revolution" of 2004, the "street revolution" this time is characterized by violence. The role of the West should not be underestimated during this Ukraine crisis. The main reason that Ukraine suddenly suspended the trade deal with the EU is because the EU refused to provide economic aid to Ukraine. Ukraine believes that it will need US$160 billion in the coming 10 years for adaptation to European standards. However, the EU itself was struggling too and was unable to support Ukraine. After Ukraine suspended the trade deal with the EU, many Western countries began to worry that Ukraine would be incorporated into Russia’s sphere of influence. The EU and Washington have stepped up pressure on the Ukrainian government for an end to the violence. The United States and the EU intervened as a political crisis in Ukraine turned deadly. U.S. Vice President Joe Biden called Yanukovych several times to urge the government not to declare a state of emergency and work with the opposition. In fact, the United States had been too soft on Ukraine's opposition. Former U.S. Secretary of State Hillary Clinton repeatedly expressed sympathy for the Ukrainian opposition. Such practice undoubtedly encouraged the protesters. The situation has spun further out of control. In any Western countries, the authorities would act to maintain order if similar incidents violence occurred. Some say that the current crisis in Ukraine is neither a “color revolution,” nor a “national coup.” It has turned out to be a national disaster. The crisis is the most severe test Ukraine has faced since its independence. Ukraine is facing the danger of splitting or suffering a long-term civil war. In this case, the Ukrainian political parties should put aside their private interests and the benefit of the party, and engage in constructive dialogue and negotiation. The international community should refrain from interfering in the internal affairs of Ukraine. Instead of pushing Ukraine to choose from whether to partner with the EU or with Russia, they should create a favorable international environment for the Ukrainian national reconciliation. The author is a research fellow on Central Asian studies at the China Institute of Contemporary International Relations.